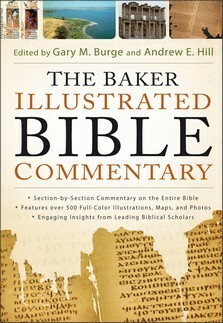 This book comes I handy when reading the Bible. The only drawback I have on it is the print is small, for me anyway.But as I went through my journey in the Bible, it really helped me to understand the passages. Gary M. Burge Andrew E. Hill - Dr. Gary M. Burge is a professor of New Testament Studies at Wheaton College, where he has been on staff since 1992.The following is a personal discussion of his expertise which he published on Wheaton's site:"When Lebanon's tragic civil war broke out in the early 1970s, I was a student at the American University of Beirut studying politics and Islam. I never realized what an indelible mark this year would put on me as this dangerous national tragedy unfolded before our eyes. Since the university witnessed sporadic closures, I began studying at Beirut's Near East School of Theology (an Arab-Armenian seminary) and there for the first time was exposed to the technical study of the New Testament (under the guidance of Dr. Kenneth E. Bailey). It seemed that from here my life found its twin navigational markers: the New Testament and the world of the Middle East.Following graduation from Fuller Seminary in 1978, I completed a Ph.D. in New Testament at King's College, Aberdeen University, Scotland, under Professor I. Howard Marshall. In 1987 my research was published as The Anointed Community, The Holy Spirit in the Johannine Tradition (Eerdmans) and this launched a longstanding interest in the literature of John which continues to this day (see bibliography). But in addition, I have also retained my passion for the Middle East. Here too there has been evolution and specialization. Teaching the historical geography of Israel on site has today become a specialized interest in New Testament Galilee. But in addition, I have had the good fortune of being befriended by many Palestinian Christian pastors and learning with dismay about the suffering of the Palestinian church in modern Israel. In 1993 I wrote a study of this dilemma entitled, Who Are God's People in the Middle East? (Zondervan). I have also become active in an evangelical advocacy group, Evangelicals for Middle East Understanding, which works to facilitate dialogue between Arab and western church leaders. In 2003 I wrote a second, more thorough volume on Palestine entitled, Whose Land? Whose Promise? What Christians Are Not Being Told About Israel and the Palestinians (Pilgrim Press).As I teach New Testament at Wheaton, I want my students to grasp how knowing the unique world of the Middle East in antiquity shapes how we read the New Testament today. Jesus' cultural reflexes were different than ours and unless we understand him in his world, we risk misrepresenting his story. The setting of first century Palestine must be the lens through which we read the gospels. This has been the passion of my career since the 1970s and I want my students to inherit it."